I've just finished the second piece in a new tiki-themed series and I thought I'd post a bit of my process here on the blog. If you want to follow what I'm doing up to the moment, I often post work-in-progress pics on Instagram. To the right you can see my initial sketch for the piece. The red sketch is from my sketchbook and the one below was made in Sketchbook Pro on my Mac. In these stages, I'm just nailing down the basic composition, characters, and background. Once I had a solid sketch on my computer, I printed it out and transferred the sketch to a nice piece of bristol board using a gigantic, old lightbox that I inherited. Then I used a #2 round sable brush to ink the drawing, defining the edges and areas of shadow. I then scanned the inked artwork back into the computer and created basic color rough in Photoshop. I also used a program called Potrace to convert the line art into vector art for use in Adobe Illustrator. It does a great job and working in the vector format makes things very flexible. At this point, I'm also thinking about what I want to do for texture. I wanted these tikis to have a weathered wood and stone look. It's not always easy to achieve a natural, textured look in Illustrator, so I actually scan in pen/ink textures that I make by hand, trace them in Potrace, and paste those textures into Illustrator. Once all of the colors and textures were placed in Illustrator, I exported the file as a .tiff so that I could add detail in Manga Studio. Manga Studio is really great for brushing in clean lines and fixing mistakes from the previous steps. I enhanced some of the scanned in textures, added some plant elements, smoothed out some lines and just added detail here and there. The last step was to add a paper texture and some subtle lighting effects in Photoshop. I don't really like to do anything too dramatic in Photoshop, but I wanted to make those torches feel like they are giving off a little more light than they were in the previous versions. 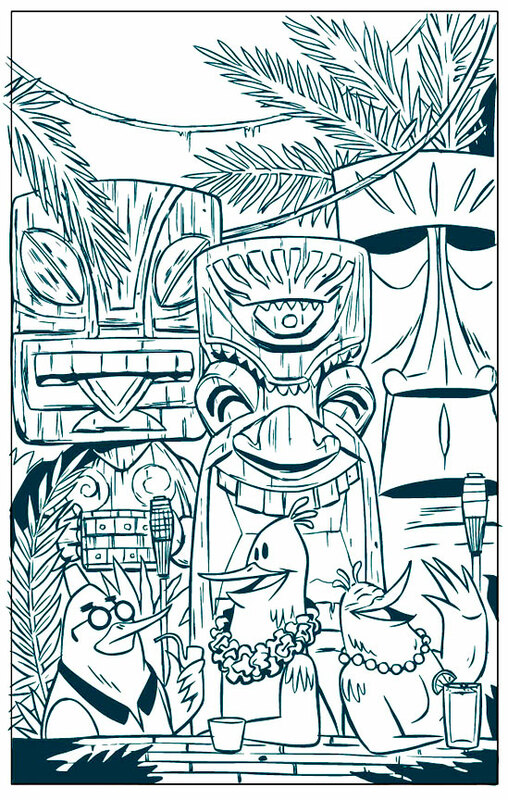 In the end, I'm happy with the way these tiki birds came out. Some parts of this process are brand new for me, but I think I'm going to stick to it for a while.